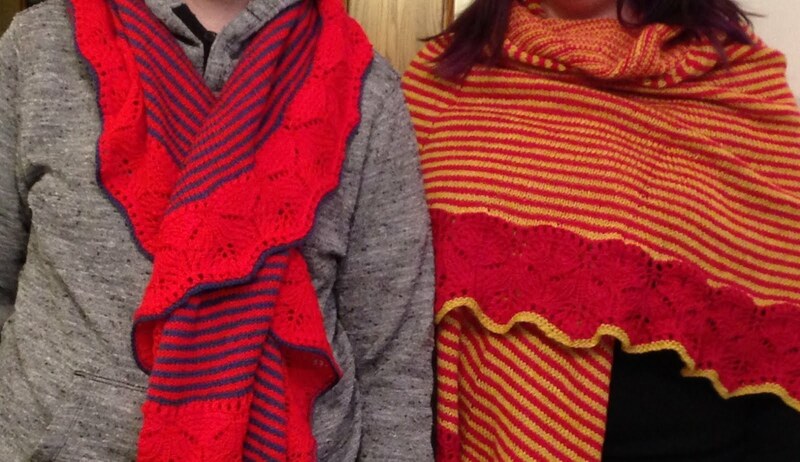 If you know me, you know that my daughter Shelbie is a fabulous and prolific knitter. I'm always after her to make things for me. And she does. Isn't that wonderful? This is Shelbie with one of the several shawls she has knitted this year. I love a shawl. Don't you? You just wrap it around and go. Shelbie uses great quality yarns so they wear wonderfully. I got the idea that I wanted this shawl and sent shelbie the link from Rita at Red Pepper Quilts. You can go to that link and see the shawls she has knitted. 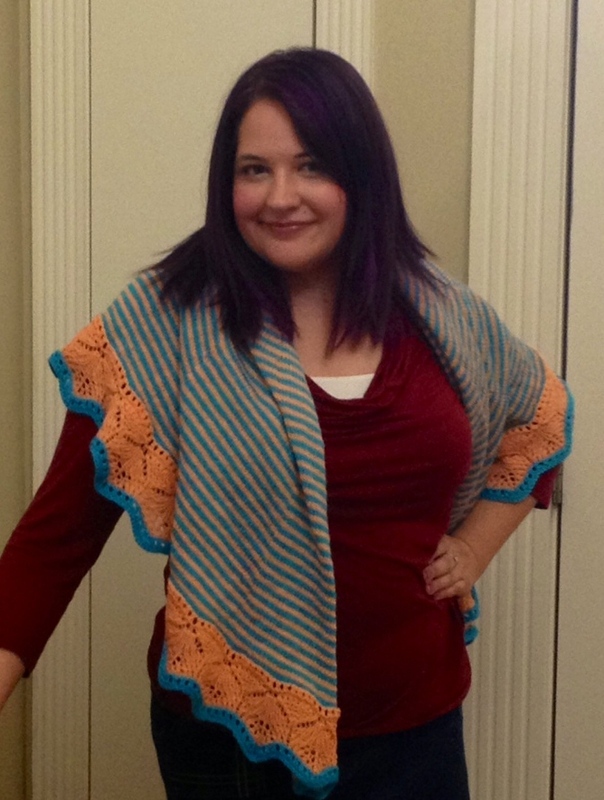 I emailed Shelbie the link and I was so glad to get my warm, wonderful shawl, customized to me perfectly. I love the stripes and I love the lace at the edge. It is fun to see how each of them are so unique depending on the yarn Shelbie uses. Don't you wish you had your own Shelbie? Over the Thanksgiving break I finished making all my blocks for my Pam Kitty Morning Love quilt. 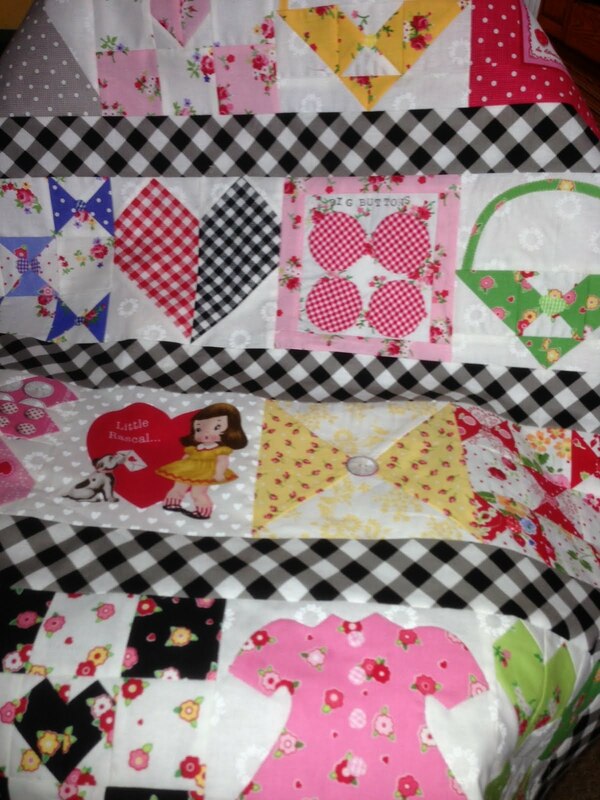 And I also began sashing my blocks. I've had a lot of fun designing and sewing the blocks. So now putting them together and seeing my ideas take shape is a big pay off. This is just a little sneak peek. Since Pam's yardage IS OUT!! 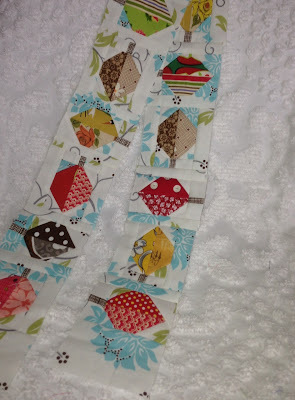 I ordered my outer border from Fat Quarter Shop. FQS has all the packs and yardage. 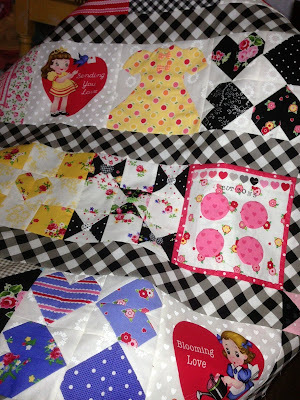 I'm so excited to get my flimsy to the quilter. I know I won't get it back before Christmas but that is ok. 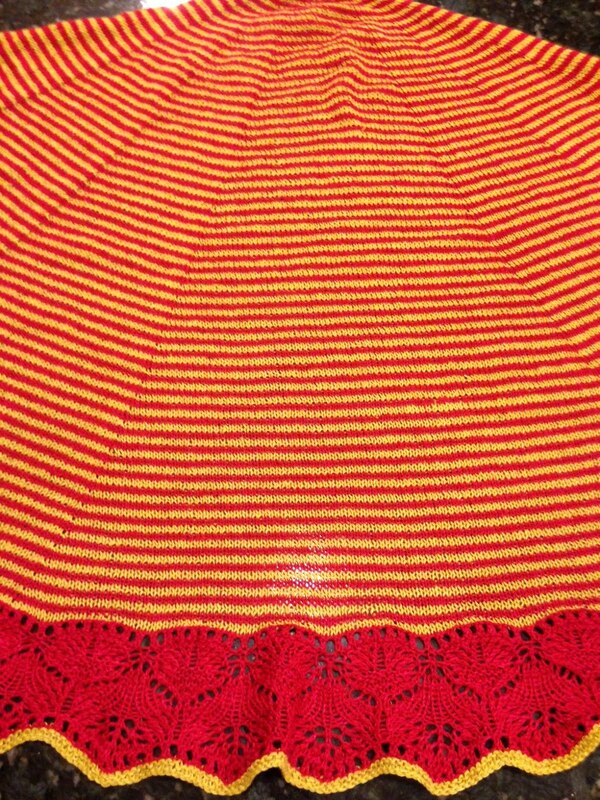 It will be here in January all quilted and my pattern will be done. Lori has row 7 up on her blog. The new block is a modernish leaf. It was easy and quick and I made no mistakes. I chose fall fabric colors for the leaves. My stems are from an open weave looking quilt fabric. I used some vintage fabrics for some of the leaves. It was a fun weekend project. 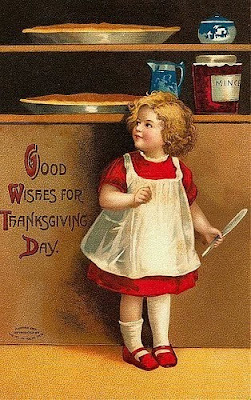 I hope everyone had a nice thanksgiving. Now bring on the Christmas craziness. Hoping you have a wonderful Thanksgiving Holiday. Don't wear yourself out! I really love templates and rulers. So I was very excited to get the scoop on Lori's new set of circle rulers put out by Riley Blake. Lori has 3 sizes of rulers: these circles, thimbles and half hexis. It is exciting to have circles that you can actually use with a rotary cutter. 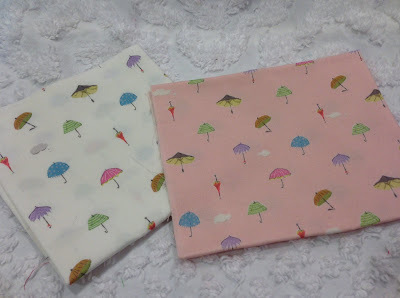 I met with Lori for lunch a couple weeks ago and we discussed my new pattern with Pam Kitty Morning fabric that I'm currently working on. Lori and I talked about an idea with both had. 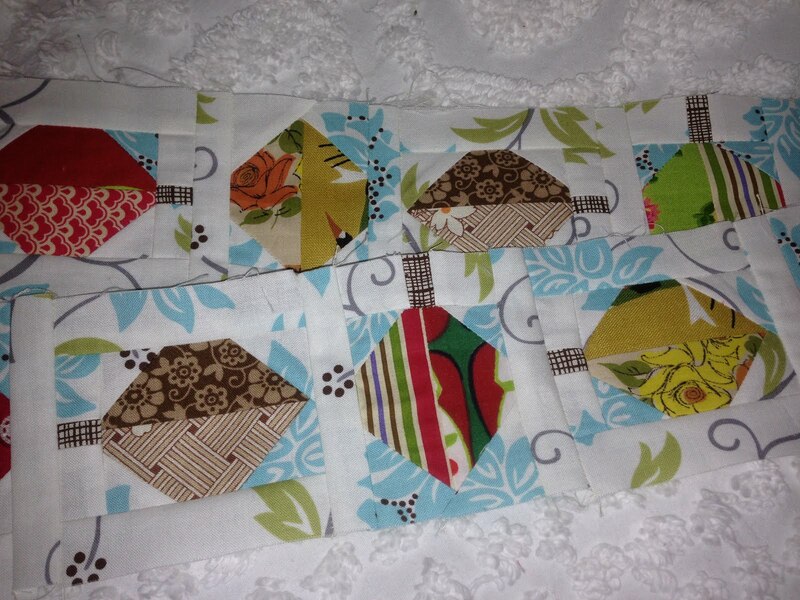 She gave me this sweet bag made from her fabric, the thick linen cloth, and stamps and pad to use on fabric. Using Lori's method she describes in this post tutorial, I got to work this past weekend using the smallest of the circle ruler/template. 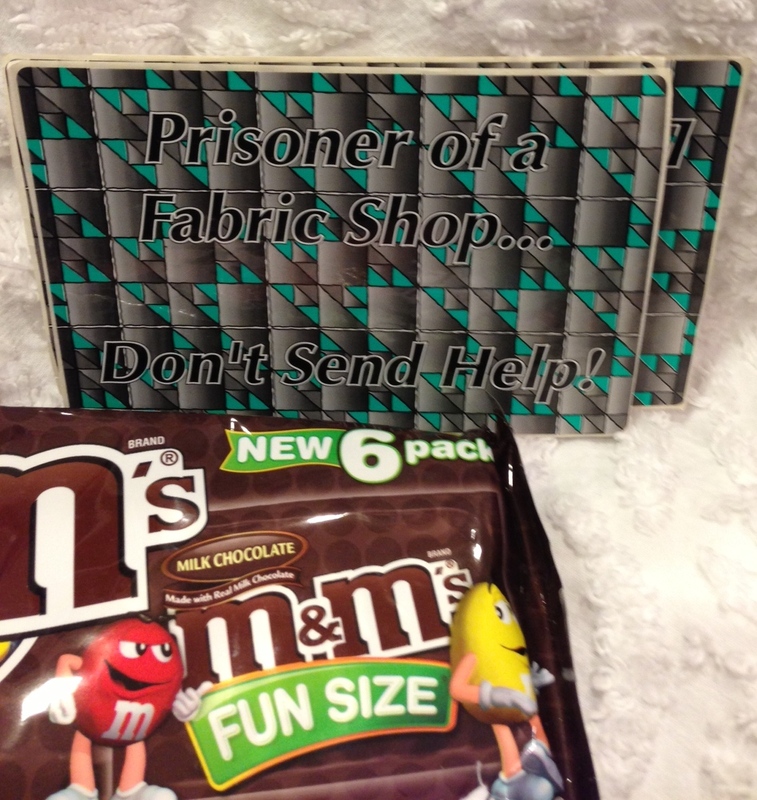 I followed Lori's idea and method to use in my new project with fabric squares and light weight non-fusible interfacing. 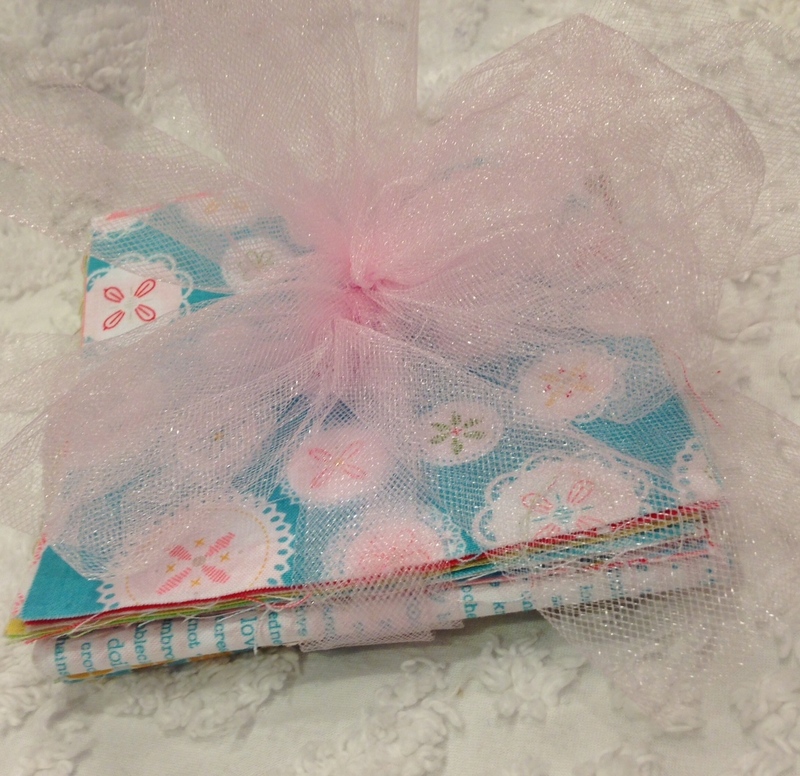 The smallest circle fits inside a 2 1/2" square just perfectly with seam allowance to spare. I traced the circle and stitched the fabric to the interfacing. I trimmed my circle leaving the seam allowance, slit the interfacing and turned and pressed my circles. This is the latest block for my Pam Kitty Love fabric quilt: Big button cards. 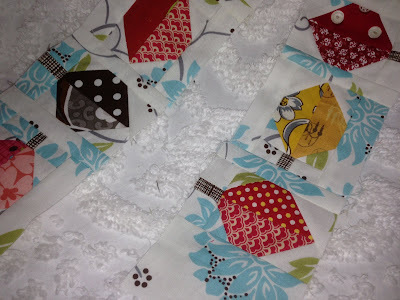 The circles applique perfectly to look like covered buttons and the stamps identify the button cards with whimsy. I'm really having fun using the circle ruler and the stamps together. I want to do more with both of them. I can't wait to use the larger sizes. Thanks Lori and Riley Blake. At the end of September my sisters and nieces came to my house for our little yearly quilt retreat. 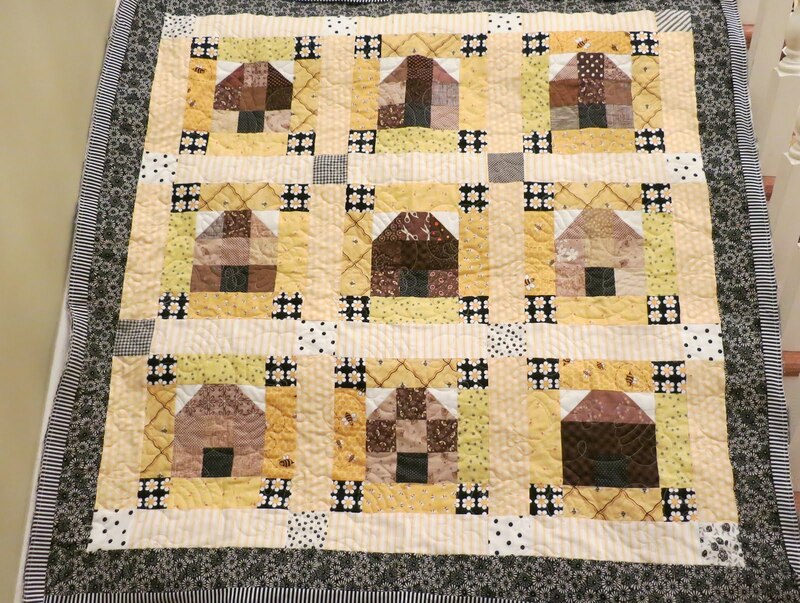 Several of them finished their 2012 project, which were from my Freda's Beehive quilt pattern. The tutorial for the blocks is here. It is really wonderful to see my family making quilts together. It gives me so much satisfaction to see the finished products. I know Freda would approve. This large version is my sister Michelle's quilt. It is queen sized and I think she's going to put it on her bed up at the ranch in Wyoming. It really turned out so beautifully. Eagle Mountain Quilting did the edge-to-edge machine quilting. I really love how it goes with the beehive theme of the quilt. 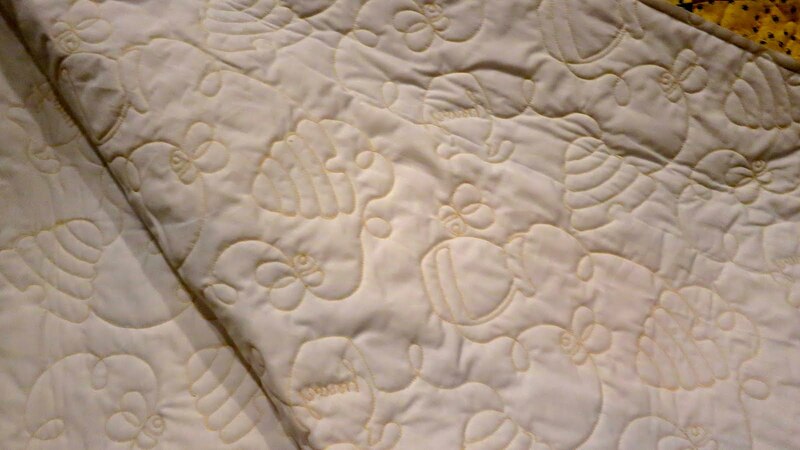 You can see the pattern better on the back of the quilt - the hives, bees and honey pot pattern stitched all over the quilt. Super cute. This is my sister Polly's table topper. I think she did a great job. 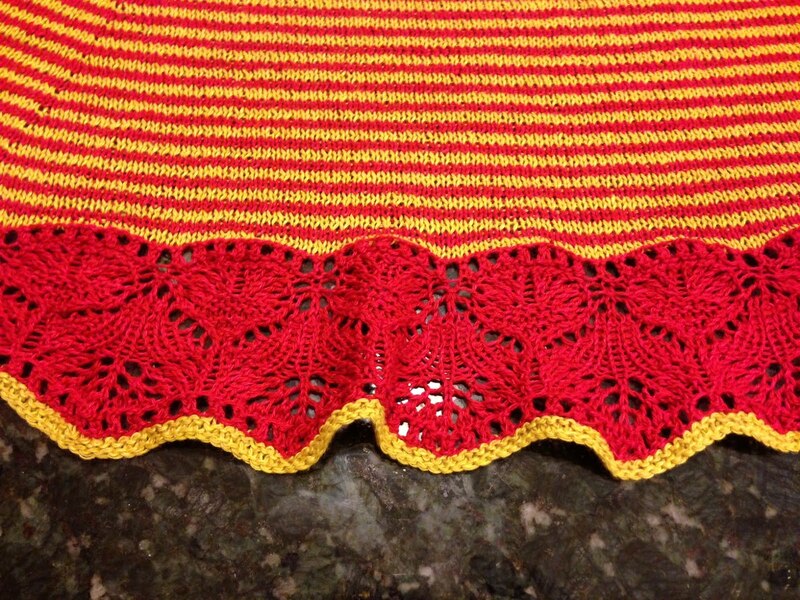 This one is my niece Tricia's table topper. She may end up hanging it on the wall. I stitched the binding on all 3 quilts so now they just have to hand stitch the binding to the backs of each quilt. That makes for good hand work on a cool evening. I hope they like how their quilts turned out. I'm really proud of them. 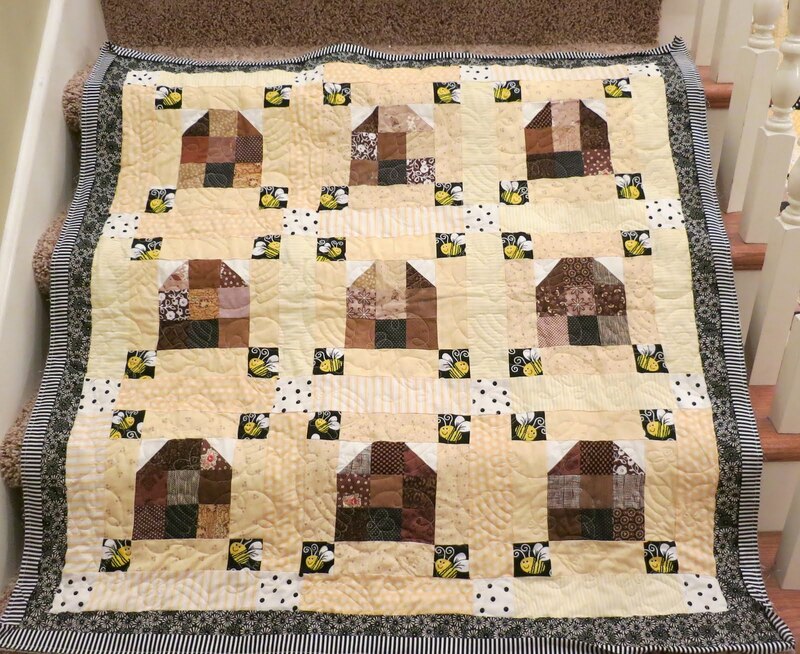 Sometimes the quilts I make get given away. Some get stacked onto shelves to look pretty. And sometimes the quilts get used. Yesterday Whitney took a stack of quilts and made Allison an big fort under my long kitchen table. 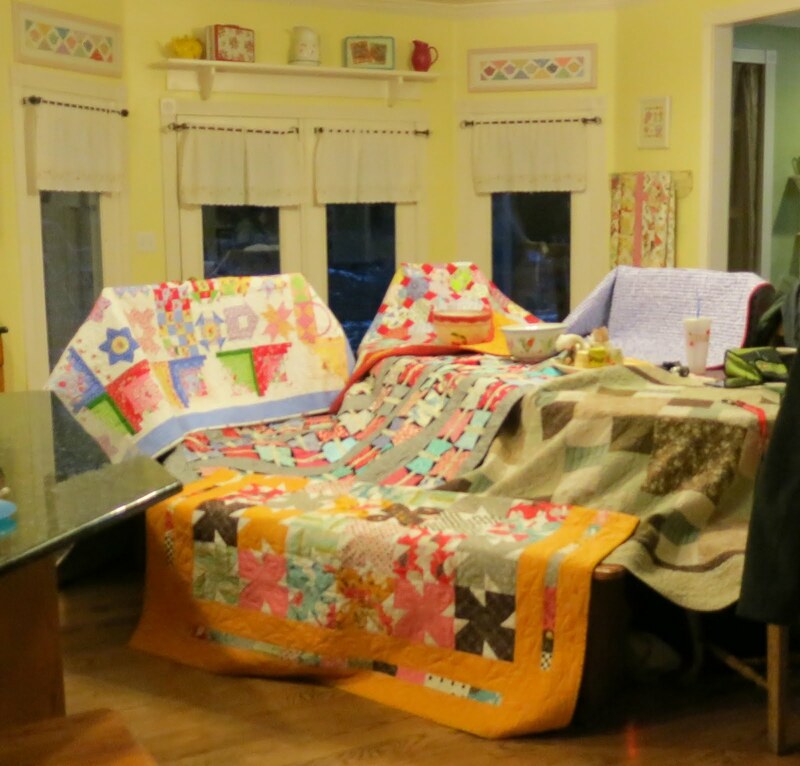 I think she used 7 quilts, chairs, benches and dishes to anchor the fort. 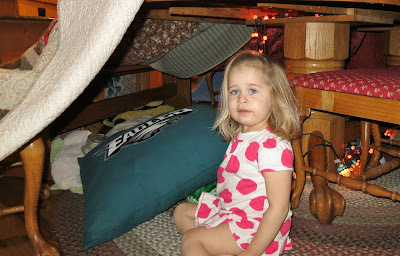 Whitney decorated the inside with pillows, blankets and (pumpkin) fairy lights so little miss Allison (dirty face) could play with and watch Buzz and Woody (her favorite movies). This was one of the quilts used. 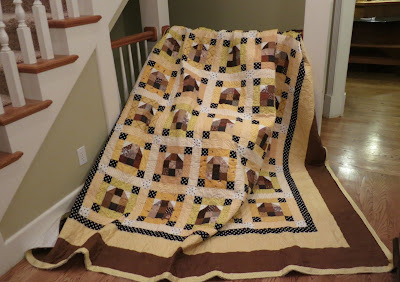 It is a quilt I made 7 years ago. I don't think I've ever showed it on my blog. I really like floating stars. 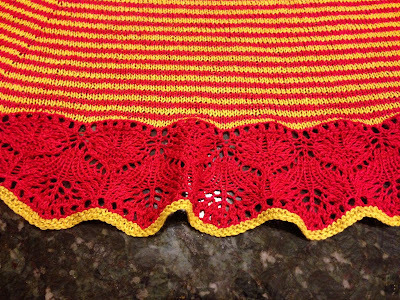 Lori from Bee in My Bonnet has put her latest block instructions up and I was anxiously waiting for them. Last week I made the flying geese and then last night I completed the cups. I'm on track. This photo is really hard to see but I edited from my iphone so it looks far away. You can see my mix of colors, anyway. Lori's method for flying geese was something new to me and the best method I've ever tried. I didn't cut off one single point. I really loved making the cups in the newest block. They were super fun and super fast using Lori's instructions. 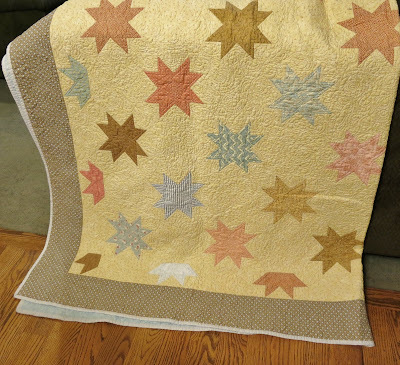 If you aren't making this quilt, then you are really missing out on an amazing, free project that teaches wonderful methods. And it is a fantastic stash buster. I should probably make 10! I've loved how easy this project is to sandwich in between other things I'm working on. The blocks sew up in a jiffy. Update from photo on Halloween Day. This is a photo of Lizzy on a blanket her mother had made for her. Whitney purchased this really nice quality Moda houndstooth flannel from one of the Cotton Way lines. She cut it to size, prewashed it, and then put the wrong sides together, zigzagged around the edges and then straight stitched about 4-5 lines diagonally across the fabric to keep it stable during use and so the 2 sides don't pull apart. Whitney machine appliqued an L for super Lizzy on the blanket. 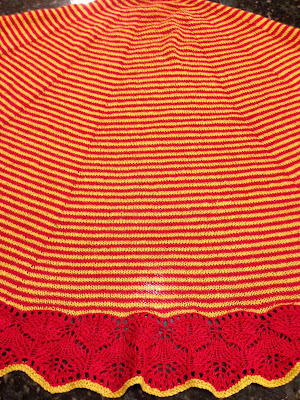 I just couldn't leave it alone with a rough edge so I chose a red dot for the binding and bound the blanket over the weekend. I has really turned out to be an eye catcher and perfectly functional. Like I said, the 2 sides of the blanket don't pull apart. The fabric isn't pilling and it is warm and snugly for Lizzy. 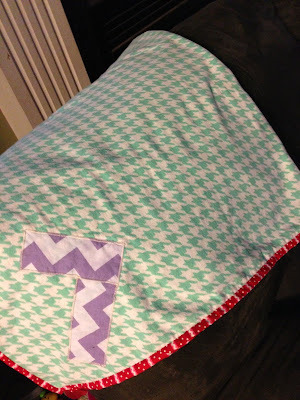 I really like Whitney's idea of straight stitching through the 2 pieces to stabilize the blanket. I want one for me! 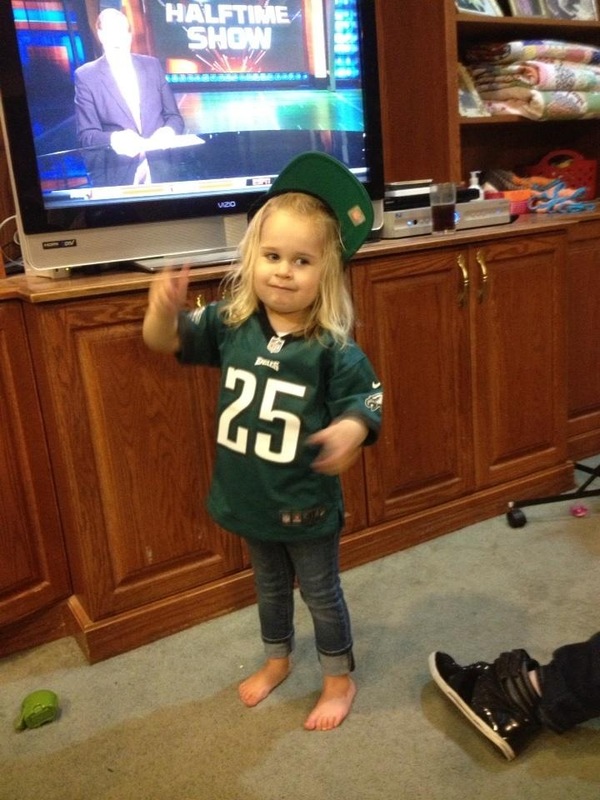 We love the Philadelphia Eagles at my house. And I mean love. It has been a tough few seasons lately and Monday night's game seemed especially brutal. We were especially pumped for a come-back. We've had some very tough losses. However, Allison doesn't seem to mind. She gets right into the spirit of game day with her jersey. My daughter Jamie has taught her the Eagles fight song and Allison is heard to say "Go Eagles" at any point in any given day without prompting her. We are able to smile through the worst loses when Allison is around to entertain. You know I've been blogging for 5 years now. Hard to believe. I've come to enjoy a whole community of quilters and friends that exchange ideas and so much more together. Some of them I've become sweet online friends with, some of the bloggers I've met, and some of them I consider best friends. I know a lot of you are familiar with many of those friends but I want to talk a little more about these 3 today. All the of the 3 are really giving, lovely women. I received a surprise package from my friend Pratima toward the end of the summer. She's the kindest person and so supportive of me and has been for years. 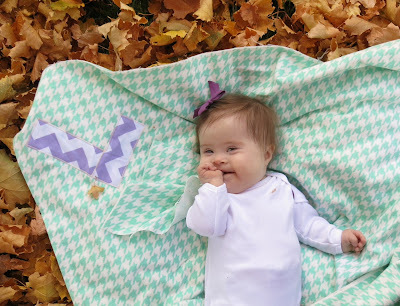 She's really coming into her own stride with creating masterpiece quilts and designing fabric. Pratima sent me this fabric she designed through Spoonflower. You can go visit it at her Spoonflower profile here. It really reminds me of her, it follows a theme, is beautiful in color ranges and the design is simple but so pretty. She also sent me some great little Gap dresses for Lizzy and Allison. This is Allison wearing hers a couple months ago when we had green grass and sunshine. 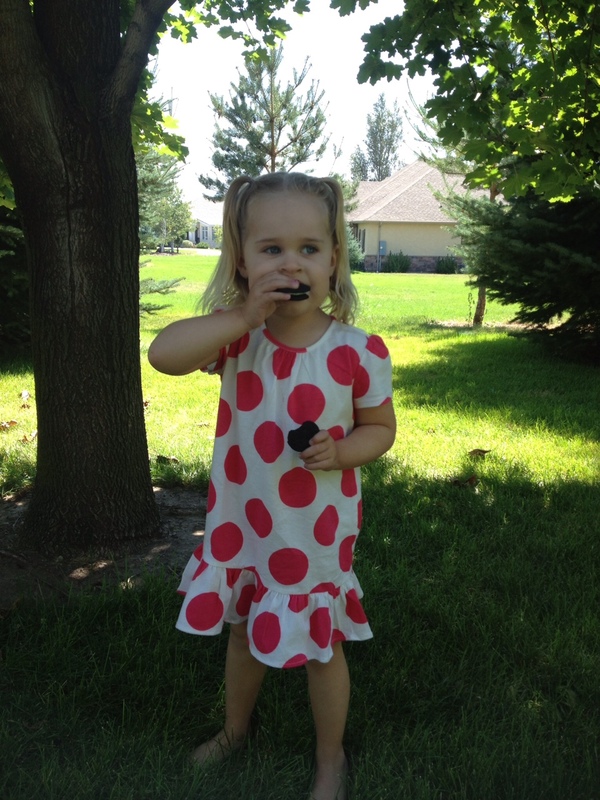 I love the polka dots and both of the girls look so cute in their dresses. 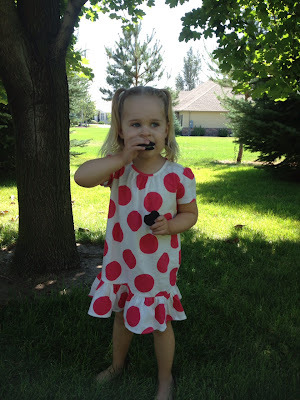 I kept telling Allie not to get oreo on that dress. Thank you Pratima for always being so thoughtful and supportive. 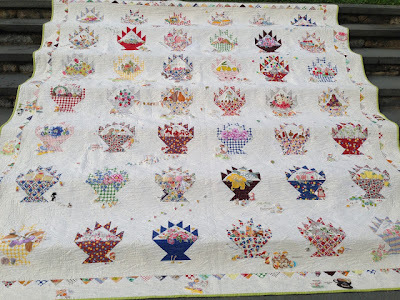 You must must must go to her blog Lakumuki and take a look at the story of her basket quilt. It is quite easily an heirloom and tells the story of a newly wed couple and things they might like to enjoy. 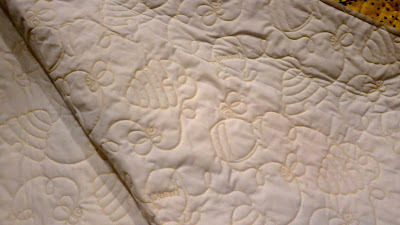 You have to go look at the detail in Pratima's quilt. That is where the story of the baskets opens up. I just love it. Most of you know Lori Holt. We are having lunch today at our favorite spot. She gave me this little charming stacker the last time we got together. I haven't been able to do more than just enjoy looking at it yet. 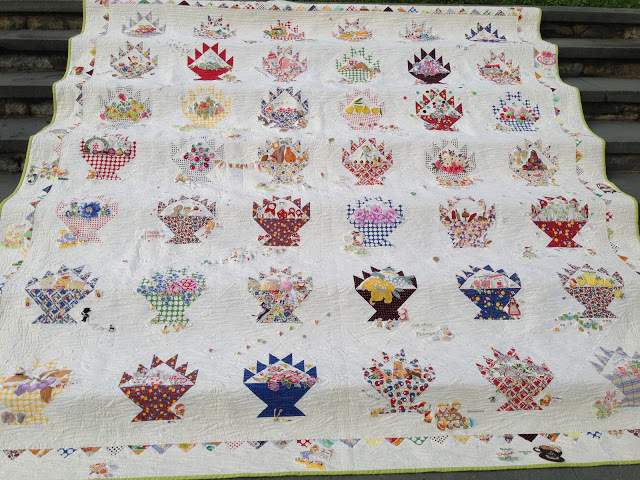 Lori showed her latest quilts and ideas at Quilt Market last week. 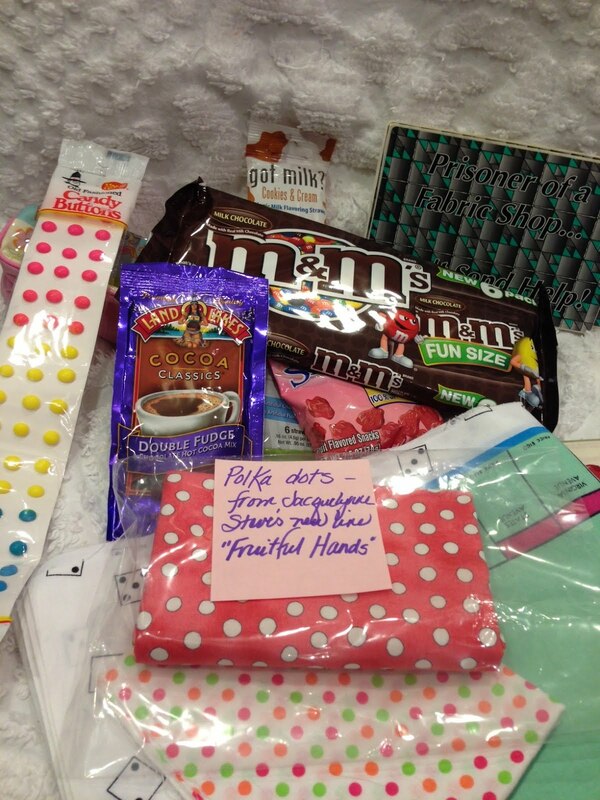 Go over to Lori's blog and look at her market pics that our good friend PamKittyMorning took for her. I've been seeing the scissors quilt in market reports all over the blog town. I love my stacker Lori. Thank you. 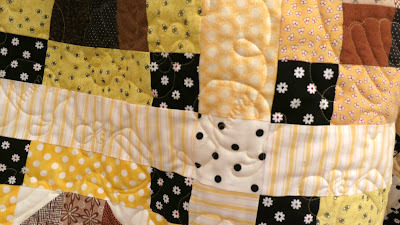 Sandi is another good friend and has a blog called A Legacy of Stitches. My favorite feature on Sandi's blog is "what's on the line?" 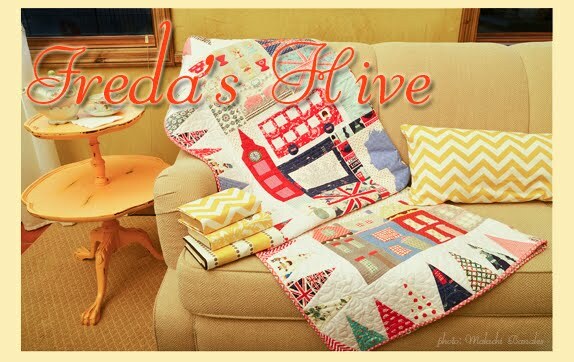 where she talks and shows vintage and new quilts. Fabulous. Sandi is another one of those friends that serves others and is thoughtful and insightful. 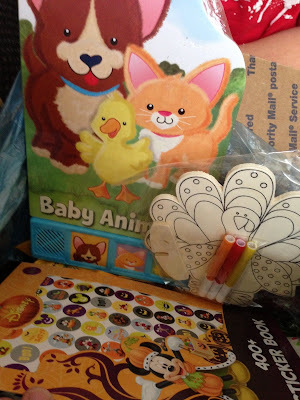 Recently she sent me a Pick-You-Up box with fun things for Allison, Lizzy and me. The box arrived full of wonderful things and so close to Allison's birthday that she thinks she has an Auntie Sandi who often sends wonderful surprises. 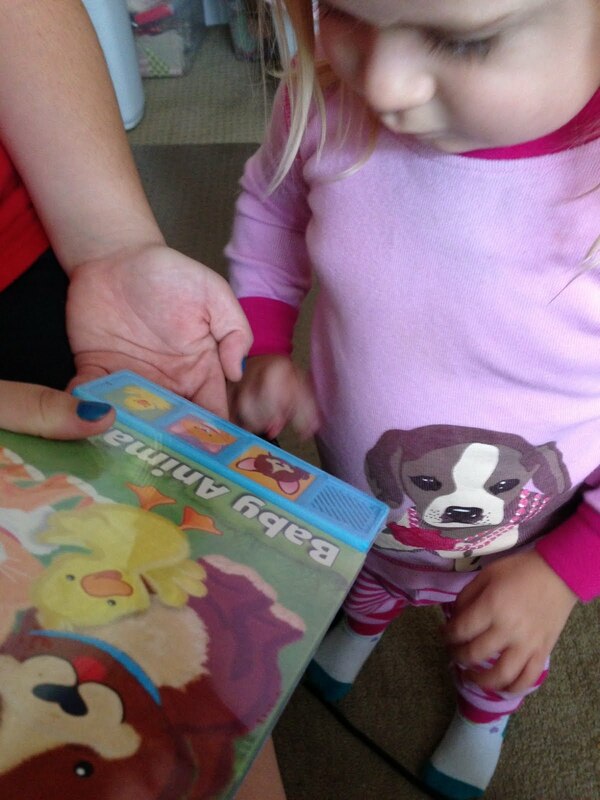 Allison shared this book of sounds with Lizzy. It was cute. 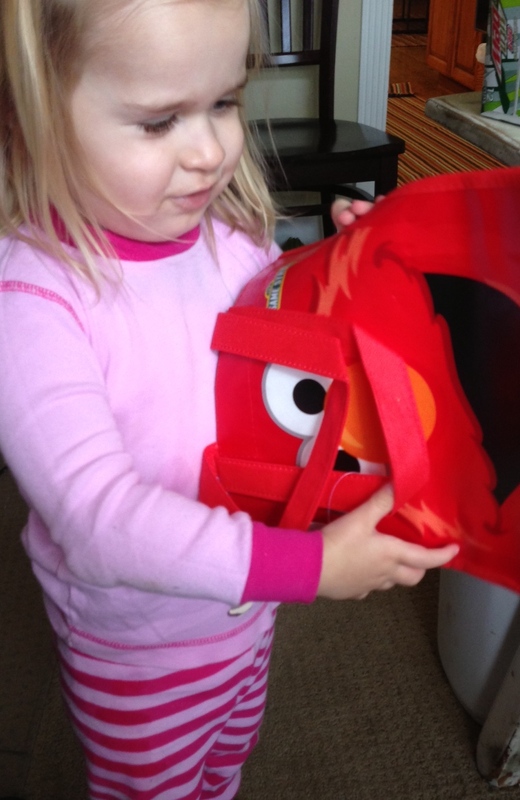 Allison thinks Elmo is her boyfriend. She's pretty tickled Sandi knows that and indulges her that way. 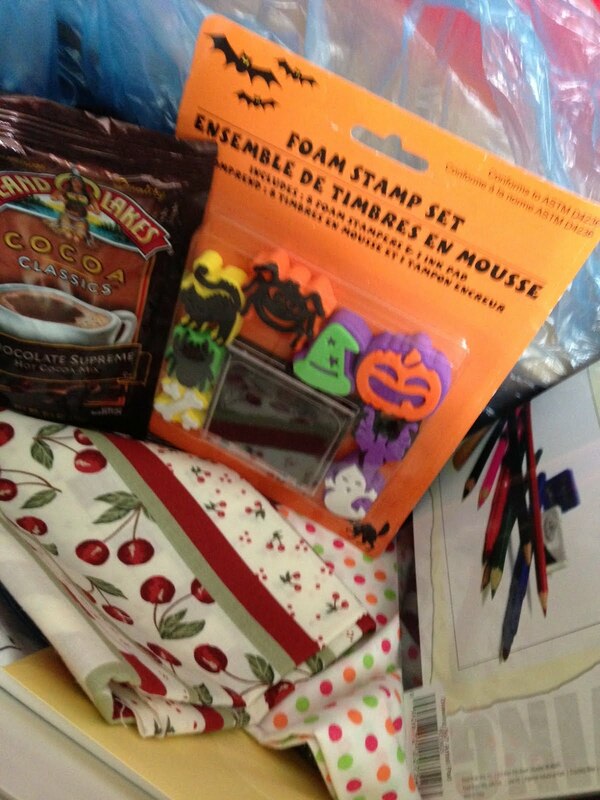 There were lots of fun art supplies and projects for the holidays for Allison to do. She sits at the little picnic table in my kitchen and enjoys creative time. Sandi knows both Allison and I have a sweet tooth so there were treats for both of us. And this perfect shade of polka dot fabric in a lovely color to go with a quilt I'm making for one of my daughters. That hot chocolate is good!! 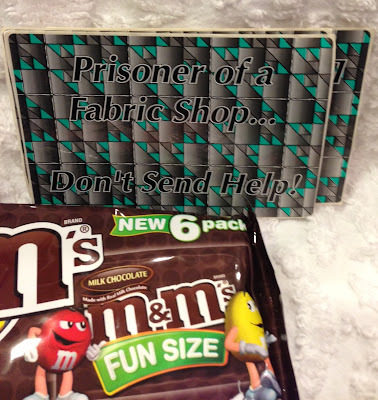 The funniest thing in Sandi's box was this sticker set that say "Prisoner of a Fabric Shop...Don't Send Help!". Too funny. Go take a few minutes and meet my friends, if you haven't already. And if you have met them, go see what they are doing lately. They all 3 inspire me. Thanks so much girls.